Raw water pump is used for generating necessary operating pressure in the pressure sand filter. Raw water is passed through CHEMTRONICS Multigrade Sand Filter at a pressure of 3.5 kg / cm2 to reduce the suspended solids present in the raw water.The filter will effectively remove up to 30 – 50 micron of the suspended solids to less then 5 ppm. The filter will have to be washed with raw water for 20 to 30 minutes daily. To filter the partials below 30 – 50 micron cartridge filter is used. The Multigrade Sand Filter is a depth filter that makes use of coarse and fine media mixed together in a fixed proportion. This arrangement produces a filter bed with adequate pore dimensions for retaining both large and small suspended particles. Multigrade sand filter is highly recommended for the removal of suspended solids & un-dissolved impurities like dust particles & heavy metals etc. doing so it reduces turbidity. Pressure Sand Filter is an ideal solution for the systems with high sediment, silt, sand, and turbidity. 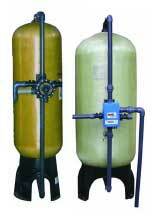 Our Sand filters are well established in media filtration technology. 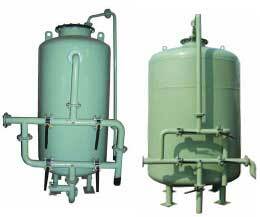 The sand filters are specially designed to take care of the range of suspended impurities. Chemtronics filtration series multigrade sand filter include vessel complete with piping & valves sand media and gravel support bed. The Multigrade sand filter is an ideal choice for all applications where a conventional sand filter is used. • It is extensively used in side stream filtration of cooling water. 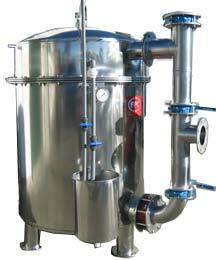 • It is ideal for filtration of clarified water. • Water used in chemical processes. 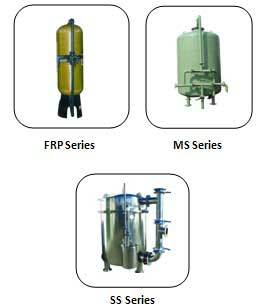 • Filtration process in Industries. • Used for pre – treatment for membrane systems. • Swimming Pool Water Filtration. • Filtration in Tertiary waste water treatment. • FRP vessels are used for residential, large commercial and Industrial applications. • Vessel is made up of Natural fiberglass shell never fades or changes color, colored shells recommended for UV protection. • 100% Corrosion –resistant both inside and out. • Physical Properties: Operating Pressure – Min 0 bar and Max. 10 bar. : Factory Test Pressure – 11 bar. • The light weight of composites can lead to cost saving like lower installation costs easier handling. • Top & Bottom Opening Vessel. • Low Pressure drop across the vessel. • Multiport valve MOC is ABS. • Manual, Semi automatic and automatic features are provided. • High Filtration efficiencies Standard and effective multigrade sand media. • Efficient Turbidity and TSS Removal. Registered Office : 38, Eastern Building, Station Road, Santacruz (West). Mumbai 400054, Maharashtra, India.